Score along with explanations will be instantly available once the test is submitted. Statistics on global performance would be emailed. The child would be assigned a "personal exam hall" immediately on payment. GSOT will be activated 5 minutes before the scheduled time and will automatically close at 11.30 a.m.
No ranking. This is a self assessment tool. 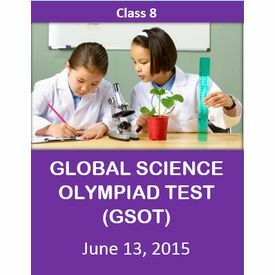 Global Science Olympiad test (GSOT) is an online test which will deeply test the science concepts and the ability of the child to apply them. This is for Grade 3 to Grade 8 students Salient features of this test: The test would be conducted on June 13, 2015 , 10.30 a.m. IST The test duration would be 1 hour Number of questions would be between 35 to 50 questions The test would be in MCQ format There is no negative marking Score along with explanations will be instantly available once the test is submitted. Statistics on global performance would be emailed. How it works: The child would be assigned a "personal exam hall" immediately on payment. Sample mock tests would be loaded so that the child can become comfortable with the system GSOT will be activated 5 minutes before the scheduled time and will automatically close at 11.30 a.m. Why GSOT: Benchamark against global competition. No geographical boundaries Thorough testing of Science concepts and their application No ranking. This is a self assessment tool.